Join us for the fabulous Guelaguetza Festival that enlivens Oaxaca the last two weeks of July with a double grand performance. Oaxaca is one of Mexico's richest cultural regions with over 16 Indian Nations, 16 languages spoken and over 90 dialects. Every July for over 500 years we have had a cultural gathering of ethnic groups that come to the city from all corners of the State to bring us color and fun, presenting marvelous dance performances, craft fairs and much more. Come and celebrate with us the joyous fiestas of Oaxaca during this special Christmas week. 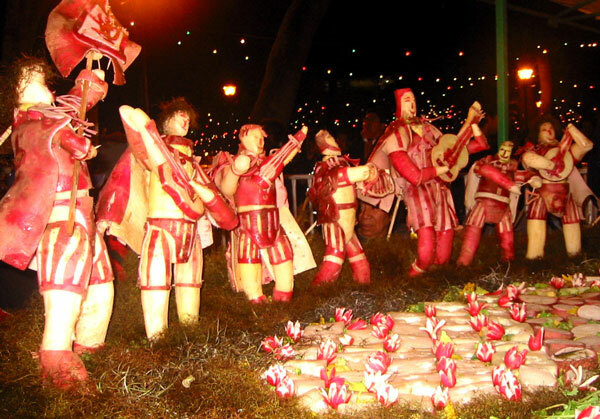 The streets are decorated with special paper cuts, piñatas and colored lights as Oaxacans rejoice with special festivities such as Posadas, Calendas, a unique Radish Festival and floats on Christmas Eve in honor of the Nativity. Come and enjoy with us these unique celebrations that make Oaxaca world famous for its cultural authenticity. Oaxaca is one of Mexico's most genuine Indian regions with special traditions from a mix of ancient, colonial and contemporary heritage that is reflected in the joyous and exceptional form of welcoming their departed. Every end of October the region's colors change as special flowers bloom in the fields, special breads, sweets and foods are made, special folk art abounds and families go to their local cemeteries for lunch or to spend the entire night singing and honoring their dead.